Yesterday, we visited with a new friend in Dupree to see her home and survey the damage from the June 16th tornados. The house, built in the seventies by the United States Department of Housing and Urban Development (HUD), is a divided two family home. 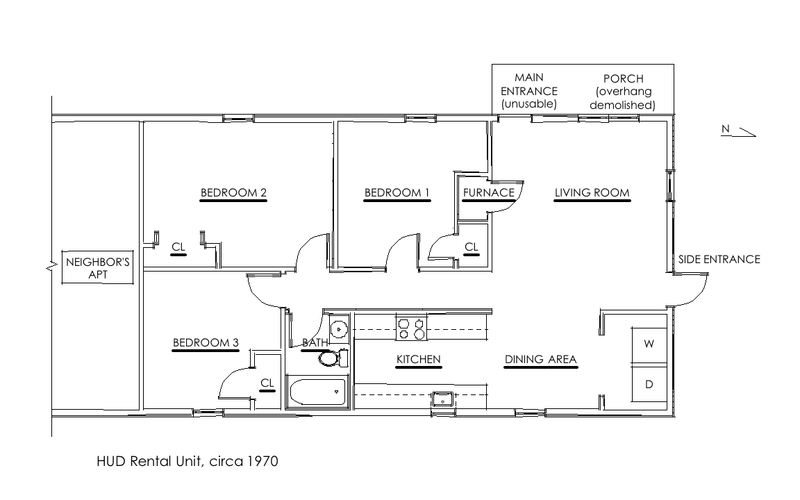 Each unit has three bedrooms, three closets, a small bathroom, a galley kitchen, dining area, and living room. Her mother moved there in 1993 with six children. Today, at any given time, 8 to 10 people live in the house. There are essentially four families in one home; our friend and her boyfriend, her mother, her brother and his two kids, and her sister’s kids. Of the adult residents, three have applications for separate housing. They do not know when or if they will be approved. Before the tornado, the house was functional but still needed improvement. When asked what they would change about the layout, the family said they needed more closet space as there is no place for linens or general storage. Also, they would like an entry area, both for coats and to buffer the living space from the weather. A second bathroom is also needed. Before the tornado, no renovations or improvements had been made to the property since they moved in 17 years ago. The biggest construction issue was that the windows and doors were not well sealed, so the house was drafty and cold in the winter. The front door faces west, but due to damage from the tornado they now use the side door on the north end of the house as the only entrance. Come wintertime, when the prevailing wind comes from the north, this will be very problematic. Some of the windows are missing screens and are thus inoperable, leaving bedrooms extremely hot in the summer. Essentially the cost of living during the winter is $1240/month and $940/month in the summer. The bulk of the money they spend each month is not on the house, but on utilities. This model seems backwards. Rather than investing more money into the property, money is being “thrown away” on utilities. They use more energy than should be necessary for a house that size in order to compensate for the poor insulation. Despite the large amount of money they spend on heating in the winter, sometimes it still isn’t warm enough. When this happens, the family uses electric space heaters in the living room or spends nights in the Dupree winter shelter. This shelter was so badly damaged during the June tornados that it was demolished shortly after the storm. They can only hope a new one will be built in time for this winter, because the repairs to their house following the tornados lack insulation. This past winter temperatures ranged from -15 to 30 degrees, not accounting for wind chill. Part of their roof was so badly damaged during the tornado that water gushed into their living room. The morning after the tornado, the portion of the roof that covers the 14’ x 15’ living room collapsed, damaging everything in the room. The Housing Authority quickly came to assess the damage and over two days installed a roof with no insulation over the living room. They were told that they were on a list to be relocated so that further renovation could happen in their home. After the next rainstorm, when leaking persisted through their light fixtures, maintenance came back and determined that the damages were fixed to the best of their capabilities – the family would not be relocated. We checked out the renovation job and agreed with the family that there was a lot that still needs to be done to make the house safe and livable. 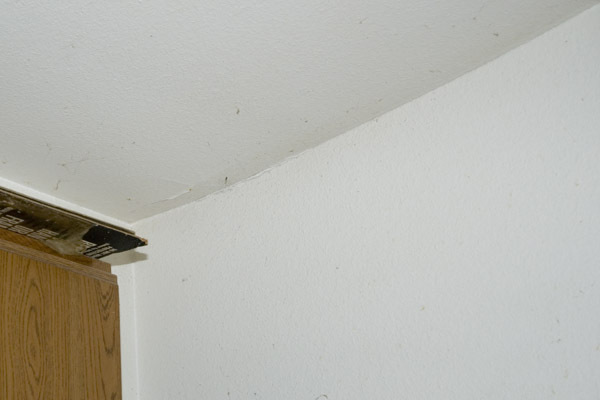 The ceiling is now sheet-rocked and spackled, but they had to cover the ceiling vent because bugs were crawling through it. The house is still not tightly sealed, and since the storm, they have been visited by spiders, grasshoppers and mice. The living room’s overhead light has damaged wiring such that they only have one option for the light – on – meaning there is an exposed live wire in the fixture. In the kitchen where the roof did not collapse, the ceiling sags and they are concerned that it may fall in during the next big rainstorm. From the exterior of the house, the roofing is poorly attached and unfinished. The drainage gutter blew away in the storm, so now when it rains, water pours off all sides of the house. 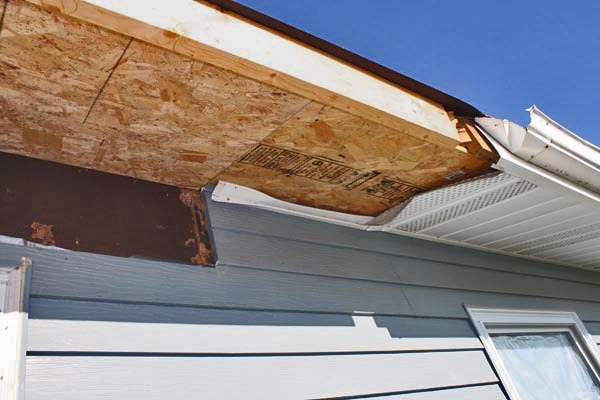 The roof overhang that protected the west side of the house from sun collapsed after the storm, leaving the living room exposed to direct sunlight. Yesterday when we visited, the high temperature was 102 degrees. The crawl space below the house, which should be available for safety during a tornado, has been leaking for years. After the storm, no one has felt comfortable going down there to check it out, fearing water, snakes, and mold. We think the lack of drainage gutters on the house will only exacerbate whatever conditions await them in the crawl space. It is hard for us to understand how this is considered finished or acceptable by any standards. [We have since spoken with the Housing Authority and were told that insurance funding should be coming soon to pay for thorough repairs] The sad truth is, there are many families in Dupree in similar situations. On this street alone, literally every other house has visible damage to the roof from the tornado. The roofs are patched now, but none of them look like long-term sustainable solutions. We are told that there are still people living in a shelter in Eagle Butte (20 minutes away), left homeless after the storm. We have heard that the Housing Authority is understaffed and under-funded, however we think their temporary fixes will only leave properties open to greater and more expensive damage in the future. Additionally, we are concerned that living conditions may be unsafe. 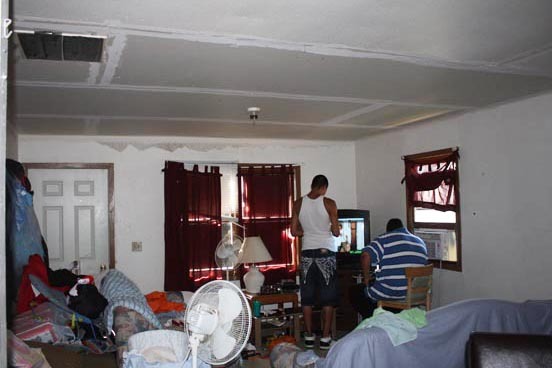 It would seem that an initial investment in better construction techniques and more thorough repairs would benefit both the Housing Authority and their renters. We have many questions about the management of these properties and the responsibilities outlined in the rental agreements. We also wonder if the Housing Authority has insurance on these properties. If they do, where is the money collected from the storm damage? If they don’t, why not? We are planning to meet Housing Authority officials next week and hope to be able to answer some of these questions. The family only recently learned about the option of renters insurance, which would protect their possessions, but not the house. If they could afford it, perhaps they could have more easily replaced some of the damaged items in their living room. After realizing how much money this family is paying monthly for their housing, we wonder if a market of private rentals might allow for better and more personal service for families like this. From our understanding, the private rental market is slim to none. People leave the reservation if they want more rental options. Finally, this young woman we visited with is truly a survivor with incredible potential. We were so impressed with her strength, intelligence and openness. We are happy to see that despite feeling frustrated by her living situation, she maintains a positive outlook. However, we hope things change for her sooner rather than later. We can tell she has unique leadership skills, passion, and discipline, despite these difficult circumstances. 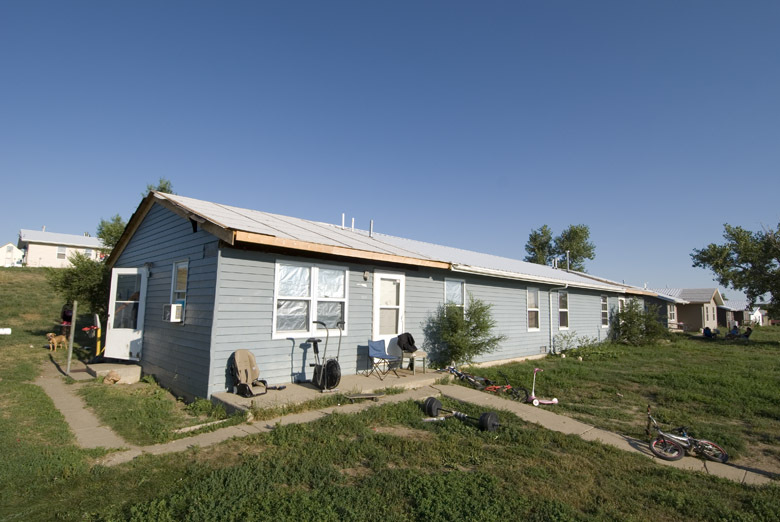 This entry was posted in Cheyenne River, Economy, Housing, Photos. Bookmark the permalink.